After two years and ten types of doctors, I am still technically undiagnosed, but I most likely have Chronic Fatigue Syndrome. My daily symptoms include drowsiness, full-body fatigue, nerve pain in my legs, headaches, dizziness, and shortness of breath. Before I got sick, I used to wake up at 5:30 to work out (something I absolutely cannot imagine doing now!). I would then go to class (I got sick my junior year of high school), study, go to work (I worked as a nanny in high school, which involved lots of physical activities such as playing tag and jumping on the trampoline), and then go to softball practice before finally coming home and going to bed around 10. Honestly, a typical day for me now looks fairly similar to the way my day used to look--it's just that now, I'm just extremely exhausted and in pain all day. The first summer I was sick, I sat in bed all day every day; not only did I still feel horrible, but I was very depressed. All I did was worry about my health. So I figured, if I was going to feel horrible anyway, I might as well enjoy myself and get something done. Now I'm 19 and have been sick for over two years. I wake up around 8, but I don't get out of bed until 9, because my legs are typically numb and exhausted. I work from home all morning (doing freelance writing); when I break for lunch, I work out briefly if I have the energy (I typically don't, but I force myself to do a few push-ups anyway). Then I get back in bed or on the couch and continue writing. Many afternoons, I leave the house for a few hours to do one of three things: tutor refugee kids at a local nonprofit, coach softball, or spend time with a friend. I can handle one short outing a day, but anything more than that might send me into a flare. After this outing, I come home and read until time for bed (9:00 at the latest). I also eat a lot throughout the day! My energy falls even more quickly if I don't. What are some of the helpful adjustments you have made? I go to bed in-between 8 and 9 every night, and I get up in-between 8 and 9 every morning. I use a wheelchair sometimes, and when I'm at an event in public or with friends, I sit down as much as possible in order to conserve my energy, because my legs will get numb if I stand too long (if I do something physical in the evening, they are paralyzed when I wake up the next morning). I eat gluten-free, sugar-free, and processed-foods-free (most days, that is!). If I'm going somewhere in the morning or in the evening--the times when I'm the drowsiest--I ask a friend or family member to drive me instead of driving myself. I couldn't survive without my Vitamin B12 supplements--they have helped me so much! I was so much sicker before I began taking them. I also couldn't live without my three daily planners; scheduling out my day during the few hours I am awake and alert helps me to attain a high level of productivity. You can learn more about CFS/ME over at the NHS and M.E. Support websites. Thank you for sharing your story, Hailey! I hope you have found some improvement. I hope that more research is put into Chronic Fatigue and similar diagnoses. I really hope so too, Cherie! 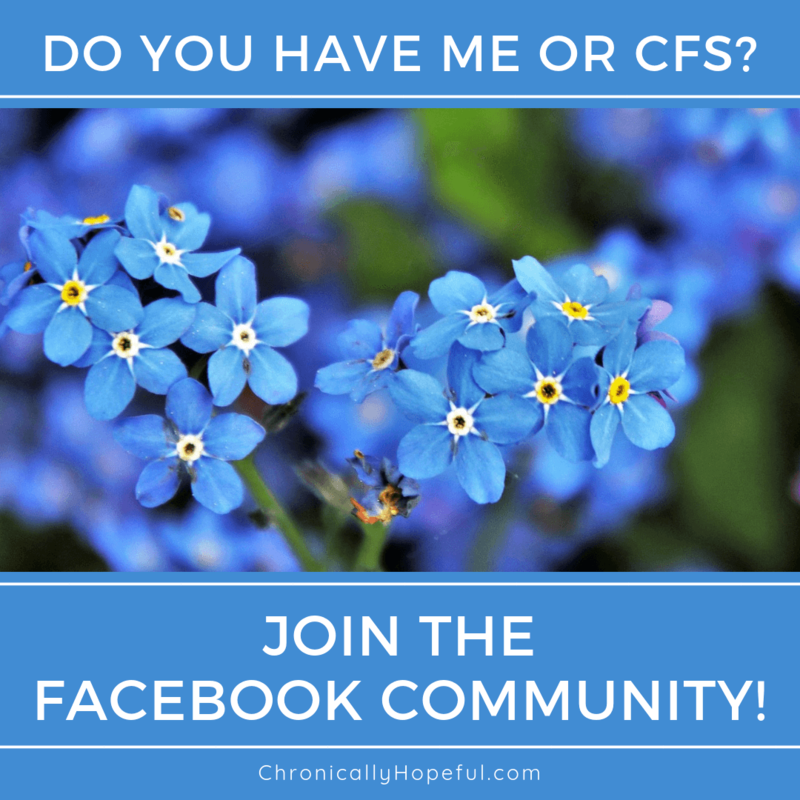 Are you also suffering with CFS? I’m partially disabled and have to moderate my physical activity so I won’t get too exhausted so I can definitely relate to that part but this sounds so much worse, I’m so sorry that they haven’t given you a proper diagnose. Thank you Lise! I appreciate you taking the time to read and I too would just like to have a name to put to the symptoms. But we can get through it together.